This cabin was the first of our “priceless treasures.” As do the others, it too has modern log construction with the “little house on the prairie loft” and a cathedral ceiling that lifts the spirits as you relax by the fire or cool from the summer heat in the air-conditioned cabin. The furnishings are “lodge-like” creating the rustic yet modern ambiance. This cabin permits you to escape to a private deck with a hot tub surrounded by nature in all of her glory. You enter this hidden world from inside the cabin to a deck surrounded by rhododendron and trees, with the echo of a bubbling brook nearby. 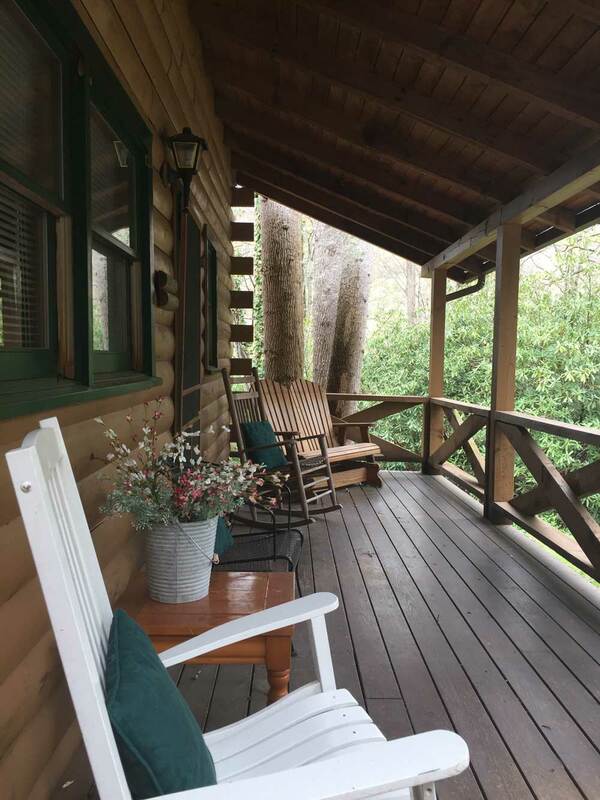 At night, there’s the porch rockers, the swing and even the deck, campfire ring, or a roaring fire in the fireplace-dependent upon the season and your desire.